06+ FZ-1, Bandit, V-max 85-2012 and Venture. 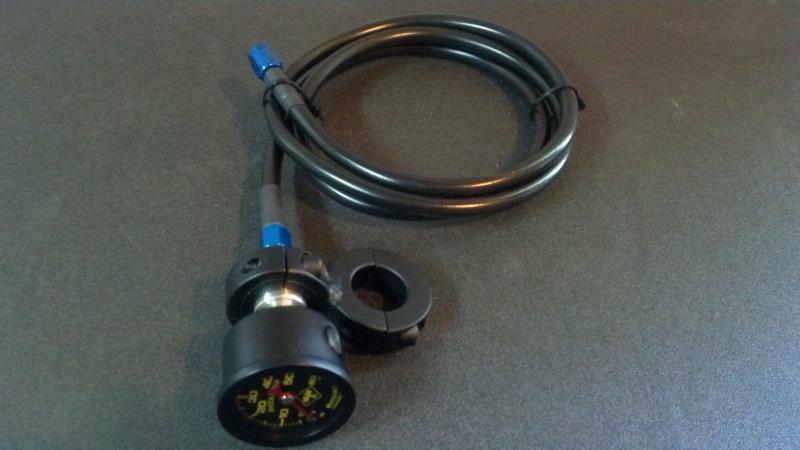 Handlebar mount oil pressure gauge kit. Comes complete with braid line and custom mounting hardware. Basic White-faced liquid filled pressure gauges. Easy to install fits all years. Engine mounted style pressure gauge kit. 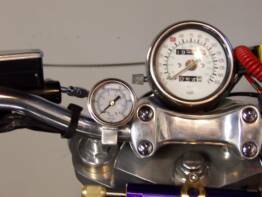 White-faced liquid filled pressure gauge to match your speedometer. Easy to install, complete with directions, and fits all years. 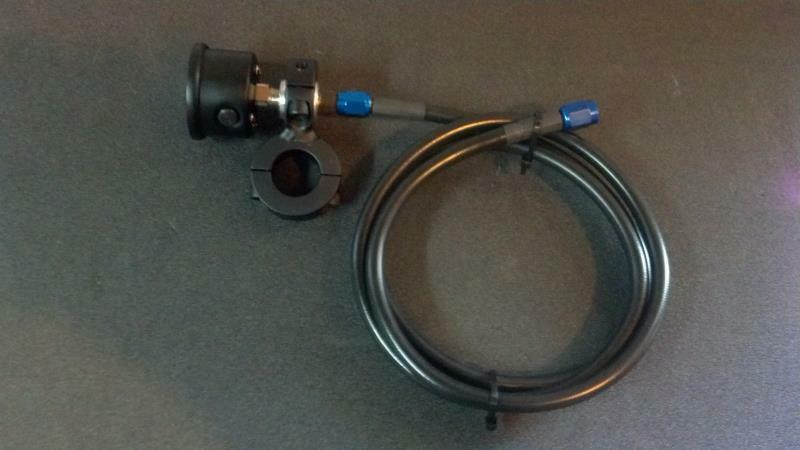 I have black-faced liquid filled pressure gauges available upon request for $20.00 more. 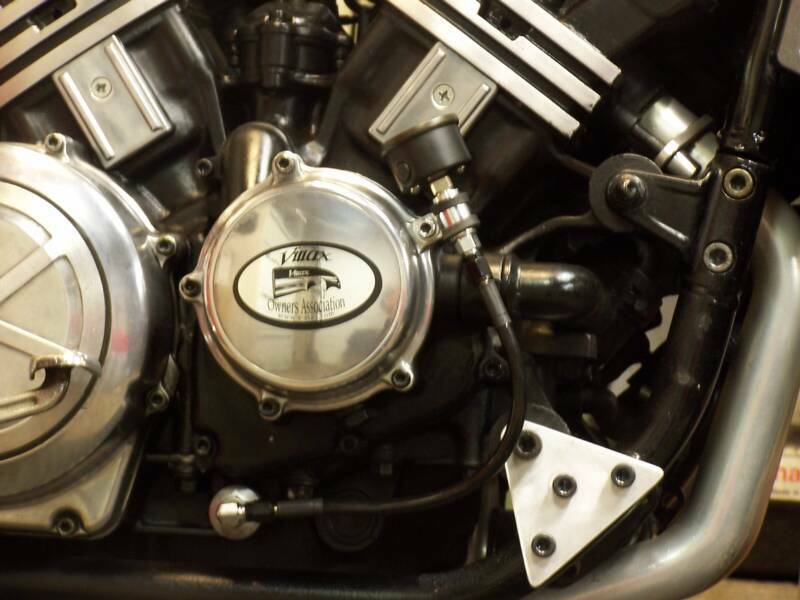 V-max and Venture oil pressure gauge kits. 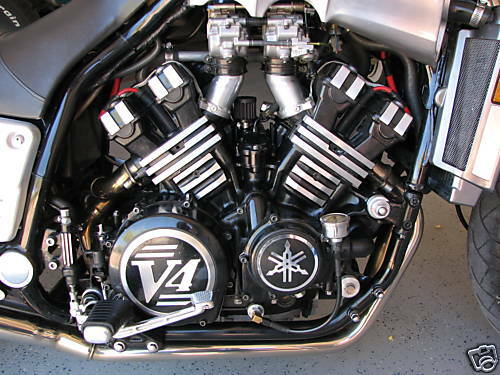 V-max -Venture Blacked Out Oil Pressure Gauge Kit. The gauge in this kit features a shockproof design along with it being glycerin-filled to dampen needle bounce caused from vibration. Black case black face gauge with a yellow design that you can view it in a low light situation. It is one of the best. Highest quality machined adapters and fittings. 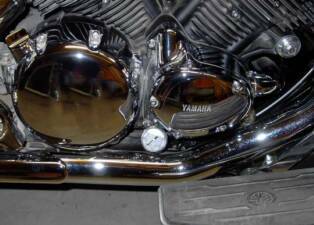 stainless or black Clear-coated line that won’t scratch your paint. 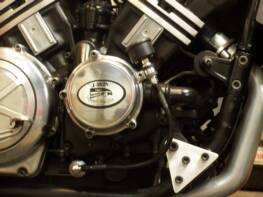 This is a water pump cover mounted oil pressure gauge kit that fits all year Yamaha V-max and venture motorcycles. This kit is quick and easy to install in just minutes, It will come complete with instructions. 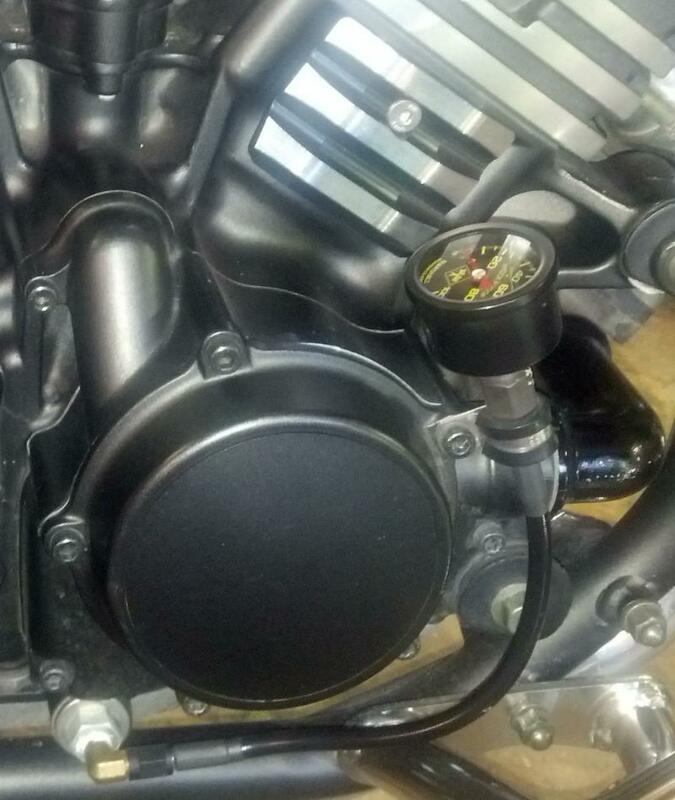 New Black out handle bar mounted oil pressure gauge kit for your V-max. This kit is easy to install and will come with instructions. This kit comes with our best gauge with a braided line black. This kit is built with only the best of parts. We like to offer a wide range of oil pressure gauges. If your bikes not listed just email us to see if we have a kit for you. This is a must for most motorcycles. You should always know what's going on in the engine. 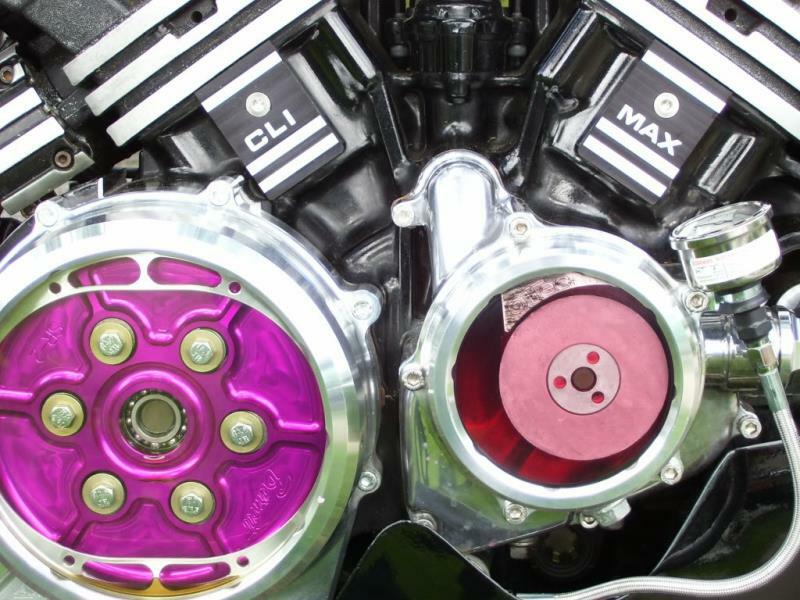 You own a V-max then you have to know what's going on as they are famous for low pressure. All of these gauges are liquid filled to dampen needle bounce and come 0-100PSI.Knowing your oil pressure is the first step in knowing what your engine is doing internally. THE GAUGE YOU WILL GET WILL BE 60PSI OR 100PSI. 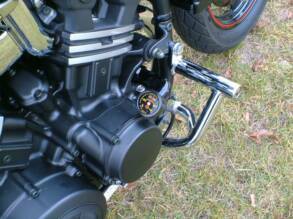 This kit is built with the parts we can get it is the best handle bar mounted you can get.